After releasing a series of moderately successful mixtapes between 2010 and 2011, Future signed a major label deal with Epic Records and fellow American rapper Rocko's A1 Recordings, which helped launch his own label imprintFreebandz. 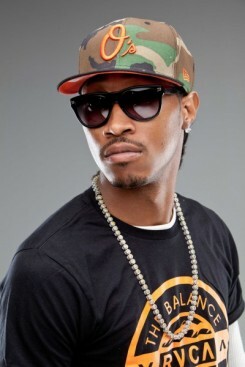 Future subsequently began working on his debut studio album Pluto, and in April 2012 released the album to positive reviews. The album spawned five singles, all of which charted on the Billboard Hot 100. The album was later re-released in November, as Pluto 3D. His second studio album Honest, was released on April 22, 2014, and is also performing with his group Freeband Gang. Future was born in Atlanta, Georgia and is of Haitian descent. His stage name came about after members of the musical collective The Dungeon Family called him "The Future". His first cousin, producer Rico Wade of the Dungeon Family, encouraged him to sharpen his writing skills and pursue a career as a rapper. He attended Columbia High School. Future voices his praise of Wade's musical influence and instruction, calling him the “mastermind” behind his sound. He soon came under the wing of Atlanta's own Rocko who signed him to his label A-1 Recordings. Since then his work ethic has driven him to his success. From 2010 to early 2011, Future released a series of mixtapes including1000, Dirty Sprite and True Story. The latter included the single "Tony Montana", in reference to the Scarfacefilm. During this time, Future also partnered with Gucci Mane on the Free Bricks collaborative album and wrote YC's single "Racks". Future signed a major label deal with Epic Records in September 2011, days before the release of his next mixtape, Streetz Calling. The mixtape was described by XXL magazine as ranging from "simple and soundly executed boasts" to "futuristic drinking and drugging jams" to "tales of the grind." A Pitchfork review remarked that on the mixtape Future comes "as close as anyone to perfecting this thread of ringtone pop, where singing and rapping are practically the same thing, and conversing 100% through Auto-Tune doesn't mean you still can't talk about how you used to sell drugs. It would almost feel antiquated if Future weren't amassing hits, or if he weren't bringing some subtle new dimensions to the micro-genre." Though Future had told MTV that Streetz Calling would be his final mixtape prior to the release of his debut studio album, another mixtape, Astronaut Status, was released in January 2012. In December 2011, Future was featured on the cover of Issue #77 of The FADER. Before his album being released in April 2012. XXL's Troy Mathews wrote, "While Astronaut Status is up and down and never really hits the highs like 'Racks', 'Tony Montana', and 'Magic' that fans have come to expect from Future, it’s apparent that he’s poised to continue the buzz of 2011 humming right along into 2012." Future was selected to the annual XXL Freshmen list in early 2012. On January 15, 2013, Future released the compilation mixtape F.B.G. : The Movie which features the artists signed to his Freebandz label: Young Scooter, Slice9, Casino, Mexico Rann and Maceo. It was certified platinum for having over 250,000 downloads on popular mixtape site DatPiff. Future said of his second studio album Future Hendrix it will be a more substantive musical affair than his debut album and will feature R&B music along with his usual "street bangers". The album was to be released in 2013. The album will feature Kanye West, Rihanna, Ciara, Drake, Kelly Rowland, Jeremih, Diplo, and Andre 3000, among others. The album's lead single, "Karate Chop" featuring Casino, premiered on January 25, 2013 and was sent to urban radio on January 29, 2013. The song is produced by Metro Boomin. The official remix, which features Lil Wayne, was sent radio and was released on iTunes on February 19, 2013. On August 7, 2013, Future changed the title of his second album from Future Hendrix to Honest and announced that it would be released on November 26, 2013. It was later revealed that the album would be pushed back to April 22, 2014, as it was said that Future has tour dates with Drake on Would You Like A Tour?. In December 2013, it was announced that Future would make a guest appearance on Kat Dahlia's upcoming debut, My Garden.